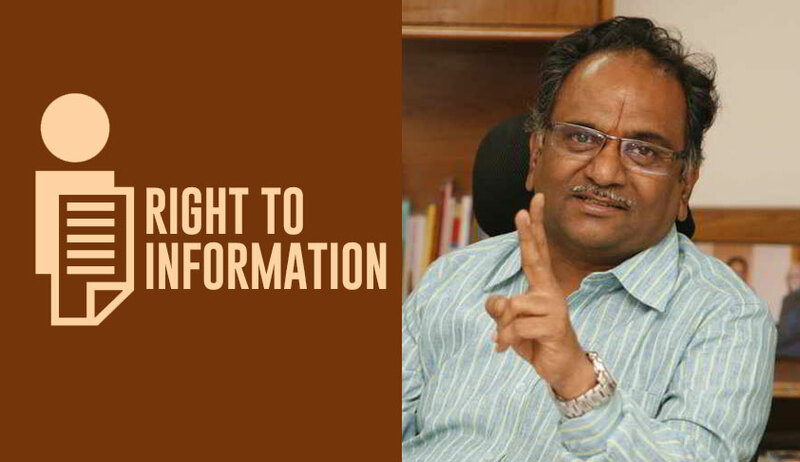 "It is undeniable that his tenure has strengthened the RTI regime, shaping it as a powerful tool to ensure constitutional governance"
Professor M Sridhar Acharyulu(also known Madabhushi Sridhar) has retired as Central Information Commissioner yesterday, after an eventful tenure of five years. A law professor at NALSAR Hyderabad and author of several books of law and journalism, he was appointed as Central Information Commissioner on November 21, 2013. It will not be an exaggeration to state that during this period, he transformed the office of CIC from that of a mere appellate authority under the Right To Information Act 2005(RTI Act) to an institution which plays a proactive role in maximising transparency and accountability in public governance. His recent directions to the Prime Minister’s Office and the Reserve Bank of India to disclose information on wilful loan defaulters came as a fitting finale for his maverick term. His exasperation and anguish at the blatant defiance shown by RBI against 11 previous orders of CIC was expressed in the hard-hitting order. The timely compliance of the orders could have prevented the deep rot in the financial system, preventing the easy escape of millionaire defaulters from the country- he painfully noted in the order. The directions did not go seemingly go down well with the Chief Information Commissioner R K Mathur, who observed that Acharyulu breached "protocol" by his orders to RBI. In a letter shot to the CIC R K Mathur, Acharyulu stated that CIC should feel embarrassed that its orders are being openly defied. "Are we under oath to help in the concealment of details of those who thrive on fraud despite the knowledge that 3 lakhs farmers committed suicide across the country as they could not pay small amounts of loans?” he asked. He said that he will be bound only by the text of law and judgments of SC, and not by "unwritten protocols". He has passed several bold orders, which have rattled the powers that be. The direction issued to Delhi University in the case concerning educational qualifications of Prime Minister Narendra Modi is such an instance. The order was passed in the backdrop of intense allegations from several quarters that PM’s educational claims were bogus. There is no justification in guarding the educational details of a country’s Prime Minister like a state secret. But the Delhi University withheld information on the ground that it was third party information which cannot be given under RTI. In a strong order, Acharyulu overruled the University’s objection stating that “disclosure of educational details in no way infringes right to privacy” and facilitated inspection of records pertaining to students who passed BA in 1978, the year in which, according to University, Modi had cleared the examination. Similar approach was adopted by him in case of Smriti Irani’s, while directing the CBSE to disclose her educational details. “When a public representative declares his educational disqualification, the voter has a right to check up that declaration”, he stated in the order. His order in the PM educational qualification case led to huge furore, resulting in him being taken off the charge of HRD Ministry in the Central Information Commission. Last September, he passed an order regarding furnishing of information regarding fund utilization under MPLADS scheme. He held that people of a constituency have a right to know have every right to know progress of these works, payments made, reasons for not spending amount under the MPLADS scheme. From the basis of records, the CIC found that about Rs.12,000 crores in the MPLADS fund remained unspent. He directed the ministry to publish MP-wise, constituency-wise and work-wise details, with names of beneficiaries, and reasons for delay for all Members of Parliament. He also also made a prima facie finding that parliamentary board of political parties are a ‘public authority’ as per Section 2(h) of the Right to Information Act. A notable feature in his approach is that he analyses the issue in the backdrop of larger systemic scheme, transcending the narrow compass of RTI Act. He tries to see the macro-picture. His penchant for facts and the yearning to link them to form a broader picture may be flowing form his academic and journalistic background. For example, his order in the wilful defaulters case offers a rich factual commentary on how the burgeoning NPAs have crippled the banking system in India. He mentions that small debtors are targeted by banks, while millionaire defaulters are let off. With help of statistics,he states that timely action against millionaire defaulters would have boosted the credit facilities, providing much needed succour to the struggling ordinary class of persons. Thousands of debt-ridden farmers had to commit suicide in the face of coercive proceedings by banks. The observations by him are substantiated by sound statistics. Likewise, in the MPLADs case, he refers to statistical information on the quantum of Funds utilized and how the lack of transparency in its utilization is abetting corruption and arresting equitable development. One may wonder whether such detailed observations are warranted in an appellate proceeding under RTI Act. But, these observations are not mere obiters; rather, they provide impetus for the conclusion that disclosure of information is totally justified in public interest. His orders reveal his mindset which detests absolute concentration of power. A strong anti-authoritarian, anti-conformist thread runs through his orders. Recently, he asked the BCCI why it should not be declared a public authority under the Act. Noting that BCCI has exclusive authorization to select cricket team, he observed “this exclusiveness of authorisation created a monopoly in favour of federal body of sports for Cricket called BCCI and because of which all its wealth is created”. While sitting in IC-Division Bench, he ruled that Indian Banks Association is also a public authority, as it was performing a public function. It can be said that his orders are also guided by his empathy for the struggles of ordinary man, who unknowingly gets caught up in the labyrinth of administration. On November 13, he pulled up the EPFO for denying information to an aged pensioner regarding non-disbursement of arrears. He observed in the order that the applicant was a “victim of delay and denial”. In July 2018, he lambasted the EPFO for denying information regarding stopping a widow’s pension. In the orders, he made references to SC decisions that pension was not a bounty of the State. “The pensioners might mainly depend upon the pension for their livelihood and delaying it will be inhumane and also amounts to denial of their right to life”, he observed. In May 2018, he issued a strongly worded notice to the postal department seeking information as to authority under which it made Aadhar compulsory for drawing pension, in the light of the SC directions existing then. The ruling that Aadhar card cannot be insisted for giving information under RTI Act. Ruling that husband is not entitled to know bank account information of wife, as it infringes her personal privacy. Direction to Postal Department to disclose details of notes exchanged through post offices after demonitization. It can be seen that his orders are guided not merely by the text of RTI Act. He has breathed in the spirit of constitutionalism into the RTI Act through his orders, with his continued emphasis on protection citizens’ freedoms from oppressive and corrupt concentration of powers. One may criticise him as overzealous. But it is undeniable that his tenure has strengthened the RTI regime, shaping it as a powerful tool to ensure constitutional governance.